Green Car of the Year award now in its eleventh year. The Audi A3 is a Green Car of the Year finalist. Think “green car” and your thoughts might turn to a variety of battery electric vehicles, including the Tesla Model S, the Ford Focus Electric and the Nissan Leaf. Not to be left out are an assortment of hybrid models such as the Toyota Prius, Hyundai Sonata Hybrid, BMW i3, Infiniti’s Q50 hybrid and more. Green cars, however, comprise a far greater number or types of vehicles than those with electric batteries. Indeed, today’s “clean diesels” are often recognized as are vehicles that run on natural gas or hydrogen. To that end, the Green Car Journal has announced the finalists for its 2015 Green Car of the Year award, with the winner to be named at the 2014 Los Angeles Auto Show next month. The five finalists are: the Audi A3 TDI, BMW i3, Chevrolet Impala Bi-Fuel, Honda Fit, and the Volkswagen Golf. Only the BMW i3 is a pure electric vehicle, yet it can also be had as a hybrid. Only the BMW i3 is entirely new — the other four models are established players. 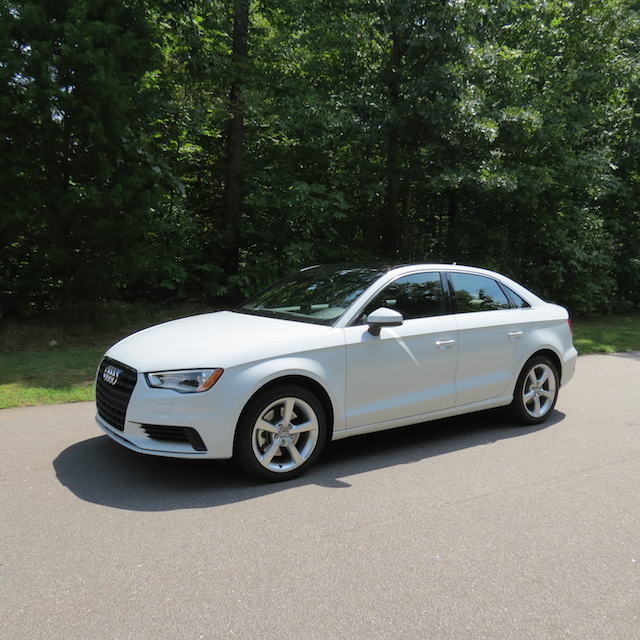 The Audi A3 TDI is an entry level model, offered in standard front-wheel drive or optional all-wheel drive. Auto Trends tested the gasoline AWD version last month — you can find our review here. The TDI is prized as it provides clean, turbo-diesel power and delivers an EPA-rated 31 mpg in the city and 43 mpg on the highway for segment best fuel economy. New on the market is the BMW i3, a compact model powered by a 170-horsepower electric motor. It offers 80 miles of all-electric range and takes 3.5 hours to recharge. A gasoline motor serves as a range extender, allowing drivers to go 150 miles before recharging or adding gasoline. This model is prized for a number of other reasons too, including its unique style and lightweight carbon fiber body. Who knew that a Chevrolet Impala Bi-Fuel is now available? The model is so new that GM announced it only on Monday. What we have with the Impala Bi-Fuel is large sedan that runs on two fuel sources: straight gasoline or compressed natural gas (CNG). What is particularly noteworthy about this rendition is that it switches to gasoline from natural gas when the CNG tank is empty. Drivers can also switch between fuel choices while in motion, simply by pushing a button. Among subcompact models, the Honda Fit is one of the newest. It is a gas-only model now in its third generation and powered by a 1.5-liter “Earth Dreams” engine. Honda’s Earth Dreams Technology means various things depending on the vehicle marketed. With a gasoline engine Honda says it “…realizes top level driving performance and fuel efficiency.” That translates to 33 mpg in the city and 41 mpg on the highway for its most efficient version. The Volkswagen Golf needs no introduction. It is a subcompact model and one of the best selling vehicles of all time. Powered by gasoline or diesel engines, the VW Golf is highly efficient and rated as high as 45 mpg on the highway when outfitted with diesel engine paired with a 6-speed manual transmission. An all-electric drive version is available in limited areas as well. The Green Car of the Year Award was introduced in 2005 and relies on a panel of jurists including Jay Leno. The remaining jurists are composed of leaders in the field of environmentalism and efficiency including Jean-Michel Cousteau, president of Ocean Futures Society; Matt Petersen, board member of Global Green USA; Dr. Alan Lloyd, President Emeritus of the International Council on Clean Transportation; Mindy Lubber, President of CERES; and Kateri Callahan, President of the Alliance to Save Energy. The journal’s editors consider a wide variety of vehicles initially before settling on five finalists “recognized for their achievements in raising the bar in environmental performance.” It is then up to the jurists to decide with the winner announced on Nov. 20. Audi A3 photo property of Auto Trends Magazine.